Globalization is a reality. Smart business people like you know they have to be proactive and expand their company internationally. Mexico, one of the largest economies in the world, is a logical choice for market expansion - especially for U.S. and Canadian companies. But we've also heard the stories about companies that spent tens of thousands, even millions of dollars to enter the Mexican market and then ran into one obstacle after another. Many closed up shop after suffering miserable sales and the loss of their investment in Mexico. Yet it's easy for you to avoid those mistakes and not risk losing your investment or months and years of costly marketing to enter international markets especially Mexico. 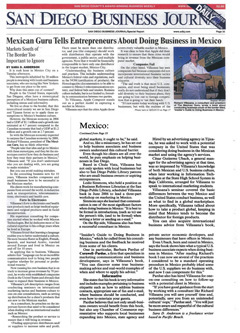 "Richard is the number one leading authority on doing business in Mexico. When my company expands and goes to Mexico he will be the first and only consultant that I hire to teach my folks how to properly do business in Mexico so that we ensure our success and you should do the same. Hire him today." Co-Author "Chicken Soup for the Athlete's Soul"
So what's one of the biggest mistakes so devastating that it has caused even multi-national companies such as Microsoft and Wal-Mart to lose hundreds of millions of dollars? Failure to know the business culture is one of the key reasons U.S. companies struggle and fail internationally. This lack of knowledge is very costly to businesses that want to enter the Mexican market or any foreign market. "Cultural understanding is one of the hidden secrets to your business and marketing success." Now imagine if you could take action to improve your company's financial success and avoid expensive and crippling mistakes. Fortune 100 companies such as Cisco Systems and AT&T value Richard Villasana, known as The Mexico Guru, for his expertise and experience in diversity and doing business in Mexico. These companies want an expert on Mexico and come to Richard to get the business and communication training and consulting they need to successfully market in Mexico. Lic. Celso Delgado, former Mexican ambassador to Argentina, sharing political insights with Richard. Potential presidential candidate, Dr. Luis Ernesto Derbez, exchanging cultural views with The Mexico Guru. Richard has appeared several times on ABC and been interviewed by NBC and KPBS Radio. Richard has been interviewed by BusinessWeek and featured in trade magazines such as CRM (Customer Relationship Management). Richard brings a unique perspective to doing business in Mexico. 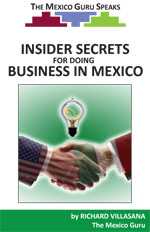 His passionate and energetic presentations and workshops based on his authoritative book, The Mexico Guru Speaks: Insider Secrets for Doing Business in Mexico, will revolutionize how your company looks at doing business both internationally and with Mexico. Your staff will learn practical, real-life solutions to the problems you anticipate, but more importantly to the problems your company can't anticipate. "Any business, government official or visitor to Mexico would benefit from Lic. Villasana's specific advice." If you want more information and to book Richard Villasana for your next corporate keynote, event or workshop, click here. He now offers sales training for Eric Lofholm International specializing in sales strategies and scripting. If you want more information and to book Richard Villasana as a speaker for your university or college event, click here. Whether you want corporate training, one-on-one coaching or an outstanding speaker who "walks the walk" and will leave your audience clapping in excitement, Richard Villasana is the speaker for your next event. Copyright © 2009-2014 The Mexico Guru All rights reserved. broadcast without the prior written permission of The Mexico Guru.